I was so excited when I received the gorgeous Wardian case from H.Potter. It was a gift to those of us who became affiliates, and I can not think of a more gorgeous gift. Since it arrived, it has been the home of the amazing air plants that I received from Etsy shop ToHold. The holiday season gave me a great excuse to decorate my terrarium in holiday style! 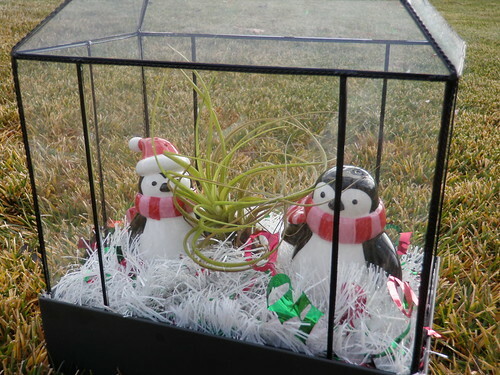 Using white tinsel with green and red “Ho Ho Ho” accents to create the base, then adding two adorable penguins, and of course my largest air plant, a North Pole scene was created. To read more about creating a holiday terrarium, be sure to visit my article, Holiday Terrariums. Included in the article is a link to a fun video that H.Potter put together of other Wardian cases that are decked out with holiday spirit! You will see mine in the video as well! I love the idea of changing and decorating the terrarium for the different holidays. There are so many fun ways to do it too, either using accents, or actually changing the plants! The Wardian case is becoming such a fun decorating piece in our home, I am just so happy they sent it to me! What about in your home? Do you have a terrarium? Do you decorate with holiday plants?